The Saint Matthew community sponsors a Haiti Twinning Project to help the parishes in the Village of Bois de Lance, Haiti. We have a large group of parishioners focusing on a School Friendship Program and fundraising for special needs for the people and priest of the village. We also organize mission trips of service to the area. Contact David Siler at 317-845-0094 or Jan Baele at 317-257-9145 for more information. Below are more details about our efforts. 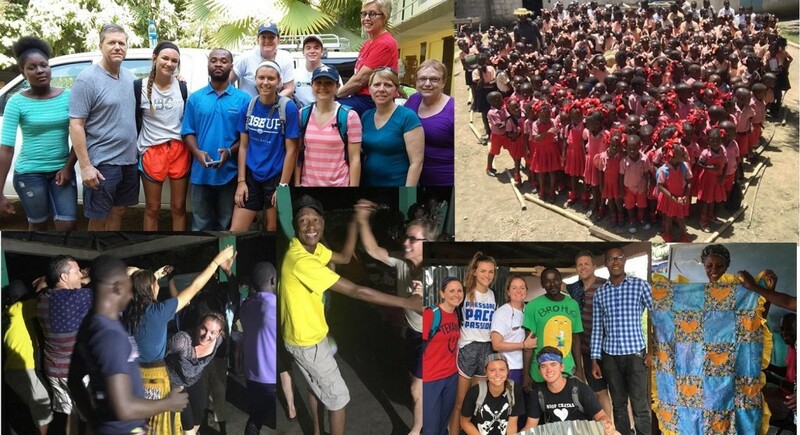 Haiti School Friendship Program Sponsorship/Renewal Weekend was Dec. 1 and 2, 2018. You can renew or become a sponsor at any time. Contact Robin for information. Or click here to complete the Haiti School Friendship Program Sponsorship Form. To our generous St. Matthew community: It is with full hearts that we thank you for making the 2018 Haiti School Sponsorship Renewal the most successful to date. Through your generosity, we are so grateful to share that the total number of sponsorships (new and renewal) is 179, and if we receive all payments, we will have raised more than $40,000. All will directly benefit the education, and thus the lives, of so many children in the schools we support, schools that continue to grow and flourish. February 2019: We spoke to Pere Max in Haiti. It was very sad. He asked us to pray for an end to the turmoil in Haiti. Riots and protests have been going on for over a week all over the country. He said there are “fires and death and he is afraid.” Our school in Jede is closed because the teachers can’t get there. St. Isidore, being more rural, is still open for now. The protests are an effort to remove the current president. In addition, there is a drought, and he said all the gardens have died. Please pray for our friends in Haiti. 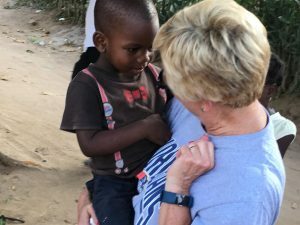 October 2018: Here are some photos from our fall Haiti mission trip. View more photos. July 2018: The container arrived just in time for the arrival of our latest mission group members from both St. Matthew and Christ the King, including Leslie and Joe Deitchman, Jan Baele, Chris Hirschfeld, Rick Gale, and Dan Patel. While the shipping container may have taken longer than expected with some unexpected “hiccups,” the serendipity that it arrived just in time (literally days before!) for our team reminds us of the importance of “In God’s Time” and not our own. This group spent 6 days working tirelessly to unpack all of the items donated so generously by both of our parishes and was able to see firsthand what it means to be able to feed 400 hungry, Catholic schoolchildren. They also painted inside and most of outside of the beautiful, new rectory and set up all of the furnishings. 60 GALLONS OF PAINT were used!! And yes, the number of children being reached through the schools we support has grown as grade levels are to be added each year for the next few years. As this part of our mission work grows, we want to thank all of you who have been a part of our Haiti Friendship Program, which pays for all of the teacher and staff salaries in the schools we support. We again are so grateful to Christ the King for making sure all of the children have a nutritious meal during the school day, which is critical for them to be able to focus and learn. We continue to have many children yet to be sponsored, and while we will have our annual sponsorship drive again this December, sponsorships may begin at any time during the year by contacting Amy Stimpson. Beyond this, we are grateful to report to all of you that through your generosity and God’s grace we have met every goal to date. Planning has begun for what comes next and how we can grow this mission work that is truly a mutually beneficial relationship between St. Matthew, Christ the King, and the communities in Haiti, for those involved get as much out of their involvement as they give. To this point, we will end with a few quotes along with again expressing our gratitude to all of you for your support of this work, which we wholeheartedly believe is God’s work through our two parishes. If you are interested in becoming more involved or perhaps going on a future trip, please contact Jan Baele. May 2018: AT LONG LAST! 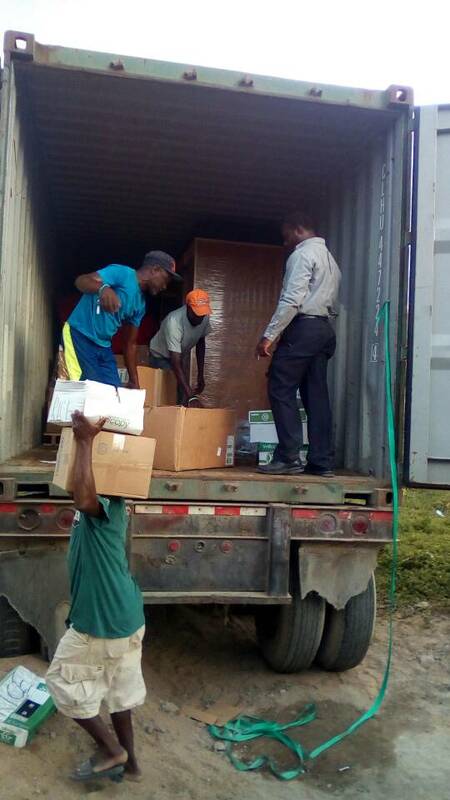 The shipping container packed full of our donated items arrived in Haiti. The photo below shows the container being unloaded. School Christmas Party 2017: Here are photos of the school Christmas party in Haiti, which was made possible by fundraising done by our wonderful St. Matthew School students. Christ the King has now joined us. They have been raising money and holding food drives to ensure all the school children have nutritious meals during the school day. When a new well for water in the rectory was needed, a mission team member ran into someone in Haiti who specialized in this and agreed to dig a well – for FREE! We needed some expertise and eyes on our projects to ensure quality and efficiency. 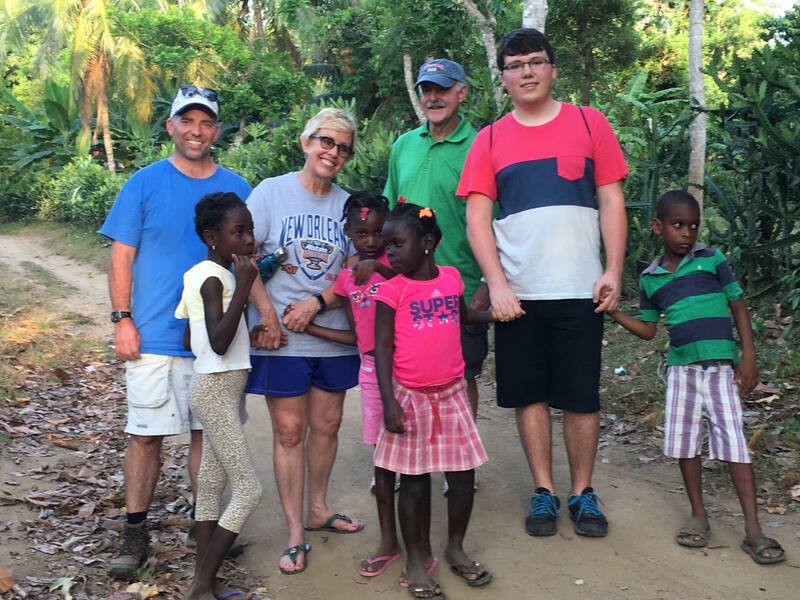 Another mission team member met “Matt” in Haiti who continues to be our “boots on the ground” and essentially the project coordinator in many ways for the building of the rectory and other building/infrastructure efforts. When food recently became an urgent need, and we were not yet able to ship food, Food for the Poor showed up with enough food for 7 months. Nutritious food is an ongoing need that we were not sure our parish could support along with our other efforts. Christ the King stepped up wholeheartedly to help fill this need. Jan Baele knew we could get items here in the U.S. at a greatly reduced cost and much higher quality compared to Haiti, but shipping cost was an obstacle. Wonderful, generous donors provided both an enormous shipping container as well as a trailer to house items collected. A chance encounter and conversation with a fellow parishioner led Jan to contact St. Joe’s College about the sale of the furnishings at the school. The sale had ended, but she called anyway. The result was her driving up and returning with a trailer filled with a number of items at 50% off, including a dining table and chairs, printers, 5 sets of bunkbeds, 15 mattresses (which they gave her for free), dressers, and more!!! There were concerns about customs charges in Haiti, but Food for the Poor has agreed to accept the container in the Cap Haitien Port, so there will be no charge. Fall 2017 Update: “Every time we see your faces here it gives us hope.” This is a quote from a Haitian teacher upon the arrival of the St. Matthew mission team in June. We hope you agree that this quote truly says it all. As reported in our last communication, we are so grateful to have Christ the King Parish join Saint Matthew in this mission by providing nutritious meals for the students during the day. In addition to our school sponsorship, the June team is happy to report wonderful progress on the rectory with the completion of the inside walls. This project has had an added benefit of employing some local workers. Empowering and working with the Haitian community is an important consideration in our mission, and with this in mind two other projects were a focus of this trip: expanding sewing skills and building chicken coops so the community might begin to have a sustainable and nutritious food source. Perhaps even more important than the projects are the relationships that continue to form between our community and theirs. A number of our own youth were able to attend the summer mission trip, and the school children adored their time with them and vice versa. The final night reflected the joy of the relationships formed as everyone attended a dance party reported to be a highlight that will become a tradition. May each of you be blessed for your continued prayers and support of this mission. See some photos below from the June 2017 trip. 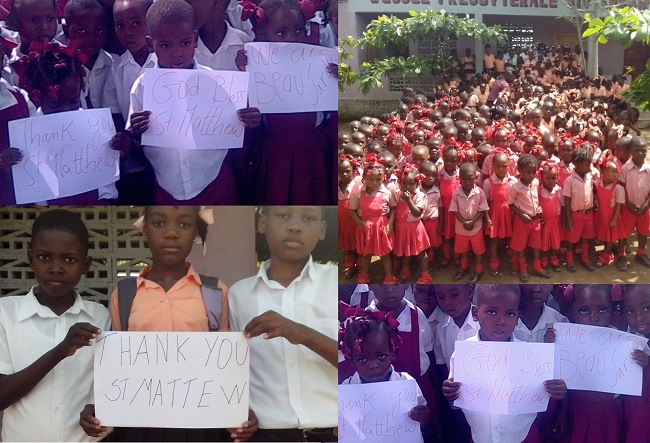 Spring 2017 Update: Our Saint Matthew community has once again demonstrated its generous heart by fully funding the two Haitian schools we sponsor through the remainder of this school year. Our Saint Matthew School students have shown the same generous spirit. In particular, over this past school year a number of our Saint Matthew first graders decided that, in lieu of gifts for their birthdays, that their friends instead make a donation to the Haiti School Sponsorship Program. As often is the case, our children inspire us, and this has led to plans to continue to grow connections between Saint Matthew School and the schools we sponsor in Haiti. 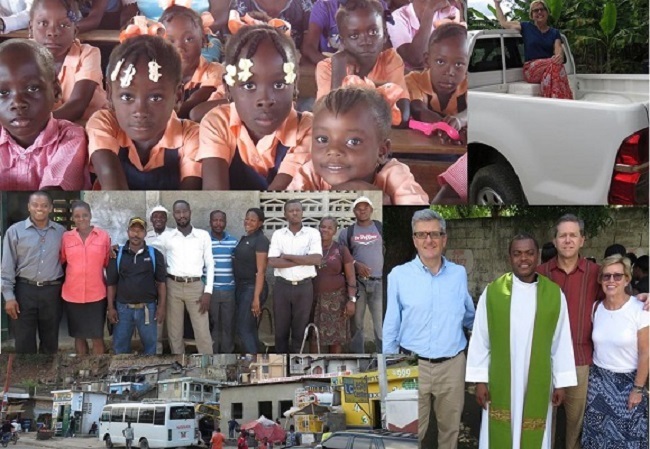 In addition, we are pleased to announce that Christ the King Parish has recently decided to join Saint Matthew in this mission and will be focusing on providing food for the students in both Haitian schools. We look forward to seeing how all of this continues to grow and take seed in our schools and our communities. We are also excited to share that the new rectory has been under construction, and it appears that it may be completed as early as this fall. Pere Max has shared that this project has had the added benefit of creating jobs for more than 15 people, including 2 local workers. He further mentioned that they are looking to add additional seating to the church because weekly services are standing-room only. What a wonderful issue to need to address! 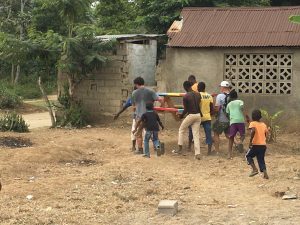 Fall 2016: Here are some photos for the fall 2016 mission trip to Haiti. April 2016: Pere Max, the pastor of the Saint Matthew twinning parish in Bois de Lance, Haiti, visited us in April 2016. 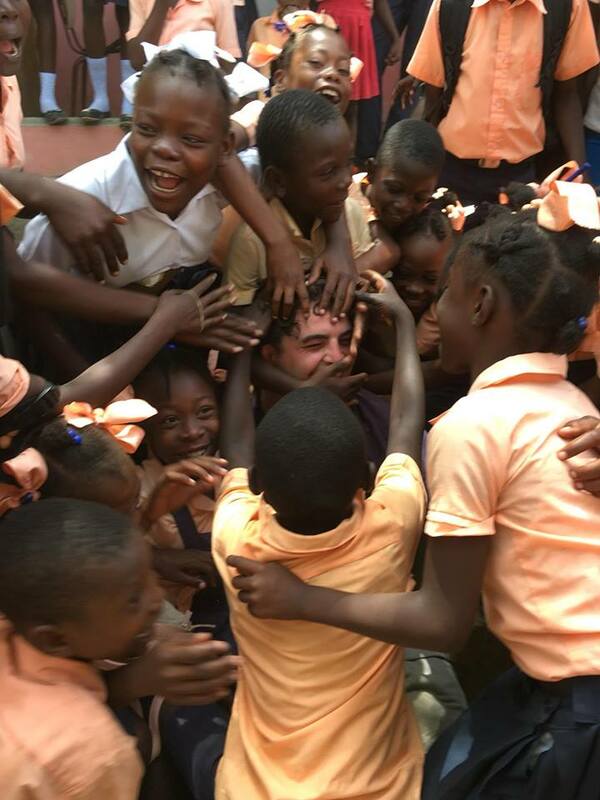 At all the Masses, he thanked parishioners for their support of the Haiti School Friendship Program and then attended “Sample Saint Matthew.” Pere Max also met with our students to describe life in Haiti and how important our support is to his community. Pere Max even played soccer during PE with the 7th graders and ate lunch with the 4th graders. Thank you to everyone who planned, assisted in, and participated in Pere Max’s first visit to Saint Matthew. 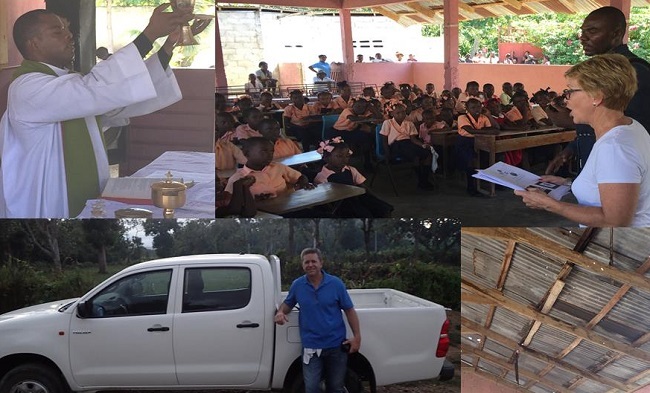 2015 Trip Photos: Below, top left: Pere Max celebrates Mass at Jede. Top right: our parishioner Jan Baele speaks to students. Bottom left: Our parishioner Dave Siler with Pere’s new truck. Bottom right: Holes in the roof at the open-air church in Jede.